If you’ve been reading this blog for a little while, you will have noticed I liked roasting veggies. (Veggie Roast, Roasted Veggies) This time I used a cast iron griddle to add the grill marks. Do you like chocolate and strawberries? Like smoothies? You will love this one. I was in the mood for something chocolate, but wanted to to be healthy. This smoothie was created. Let me know if you make it. Since reading about Amaranth a few weeks ago, I have been eager to try it out. It is a very nutritious grain*. It has lots of protein, fiber, and amino acids. It’s very tasty too! Inspired by all of the recent Recipe Redux posted with fresh pumpkin, I made a quick and tasty soup. I love spoiling my wife with a fancy breakfast whenever possible. She loves my tofu scramble, and we are both addicted to kale lately. The above was born in less than 30 minutes. I love banana bread, so I intentionally buy more bananas than I can eat in a week, so I have some left over to make this tasty bread. The bread is moist and delicious. I used to hate nuts in my bread, but have grown to love them. The walnuts provide a healthy crunch. What’s your favorite extra in banana bread? I used to make these when I was a kid. They are a great way to take advantage of almost stale or stale tortillas rather than throwing them out. A few minutes in the oven turns them into a delicious, crunchy treat. This delicious smoothie is creamy and tasty. It’s also very easy to make, and dare I say it, healthy. If you like oranges, you should try this smoothie. Apple crisp is a tasty dessert. I started making it the other day and realized I had too many pears and not enough apples, so I modified the recipe slightly to include them. The result was tasty! I’ve read about kale chips several times now, and I saw the rave reviews they have gotten. They seemed like a tasty way to get more kale into my mouth. My friends love Alfredo sauce, so when I discovered how delicious and versatile cashew cream could be I knew what I had to do. 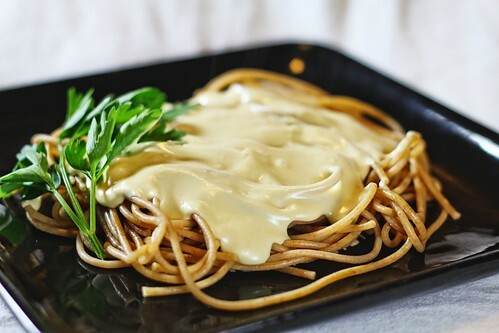 This sauce has all of the flavor of a dairy based Alfredo, but with 75% less saturated fat. The texture of this sauce is smooth, thick, and it clings to the noodles well. Did I mention it is also really tasty? Our local co-op makes delicious cookies with cranberries, nuts, and oatmeal. At a $1.39 each it was getting to be an expensive habit, so I tried my hand at making them myself. If you haven’t tried tempeh yet, you really should. It is tasty and nutritious. One our favorite kinds is Lightlife Organic Garden Veggie Tempeh. One of these days we’ll get adventurous and make our own, but for now we’ll keep buying it at the co-op. I opened the fridge looking for dinner options. The package of daiya cheese called out to me, so I grabbed it and the package of tortillas. Enchiladas came to mind. I found out about this recipe over on Vegalicious. The recipe won Best Soup in Vegetarian Times’ 2011 Chef Challenge. I found this recipe on foodgawker. It is seriously some of the best chocolate I have ever had. I was skeptical when I read the description, but I went and bought the ingredients anyways. Do you like chili? How about fries? Put them together and toss on some cheese. Wow! Very tasty and easy to make. This is one of my favorites. I love roasting veggies. It is an easy way to get something really tasty without a lot of effort. It is also a great way to use a lot of veggies before they start to go bad. Kabsa or Kabseh is a rice dish similar to biryani. It is commonly regarded as the national dish in Saudi Arabia and very popular in the other Persian Gulf states such as Bahrain and Kuwait. This is my interpretation of Kabsa for the “Cook Around the Globe” challenge – Arabian Peninsula. Be adventurous and try this recipe! This is my entry for the September The Recipe Redux. The theme this month is "Dressing for Success" - condiments, spreads, and salad dressings. The goal is to make a regular recipe more healthy by incorporating more whole foods, less saturated fat, etc. I originally saw this bread via a tweet from VeganPatriot talking about a recipe on happyherbivore. VeganPatriot had modified it to work in his bread machine. It sounded really delicious. I went straight to the store and bought some rosemary, and set about making it myself. The temperature has come down and the farmer’s markets are bursting with tasty veggies. A perfect time to roast with the oven. This recipe takes a few minutes of prep and a while to bake, but while baking the whole house will smell great! When thinking of summer and fruit, a tasty watermelon comes to mind dripping with juice. They usually come in red as you are probably imaging right now, but did you know they also come in yellow and white? I’ve never seen white, that would be neat! My wife and I were feeling lazy tonight, so we decided to do some takeout. We called Pizza Luce and placed our order. My wife and I enjoy watching VegEZ on DeliciousTV. Toni Fiore shows how to make delicious, healthy vegan food. Last night, I made her Crispy Tofu with Cilantro Relish. Wow! It was so tasty. This recipe is quick, easy, and healthy; it only takes about 10 minutes. Did I mention it was tasty? We never have any leftovers. My wife says it is “hearty and hits the spot.” I agree. It goes well with some fresh bread. I used the vita-mix to make this, but you could also make it with a regular blender and the stove.